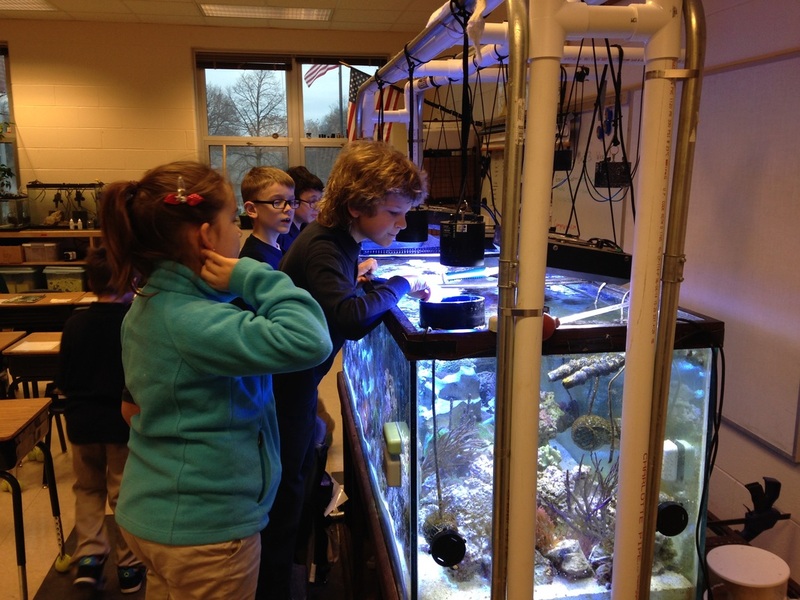 The author shown discussing marine ecology with third grade students using a tank designed to be an instructional tool. Over the past two years, I have created a large coral reef project at Stratton Elementary in Champaign, Illinois, where I work at as a third-grade teacher. Other teachers and I use the coral reef tanks I’ve built around the school as instructional tools, and I’ve created a daily aquarium club that trains students to care for the 10 freshwater and marine tanks in our school. Many teachers are beginning to recognize the educational power of a classroom aquarium and but wonder how to create a tank setup that is both safe and educational for their students, and financially sustainable. In the next two blog posts, I will share some some of things that have been vital to the success of my project and saved me a considerable amount of time and money. I will offer advice on how to create a simple marine aquarium that will be easy and cheap to build, and that will allow students to learn many important science and math concepts. Freshwater tanks vs. marine tanks: Freshwater tanks are a good way to begin an aquarium-keeping program, and are cheaper to create and easier to maintain. However, I believe that their relative simplicity both in maintenance and the livestock they support makes them weaker tools than marine tanks for academic instruction. I encourage teachers to start with simple marine tanks, if resources allow. Coral reef tanks vs. Fish-only marine tanks: The larger the spectrum of living organisms the tank can support, the more academic content can be taught by the tank, and the more interesting it will be to people viewing the tank. I advocate for soft coral and LPS reef tanks over fish-only tanks, though fish-only with live rock (FOWLR) tanks can support most of the reef ecosystem. 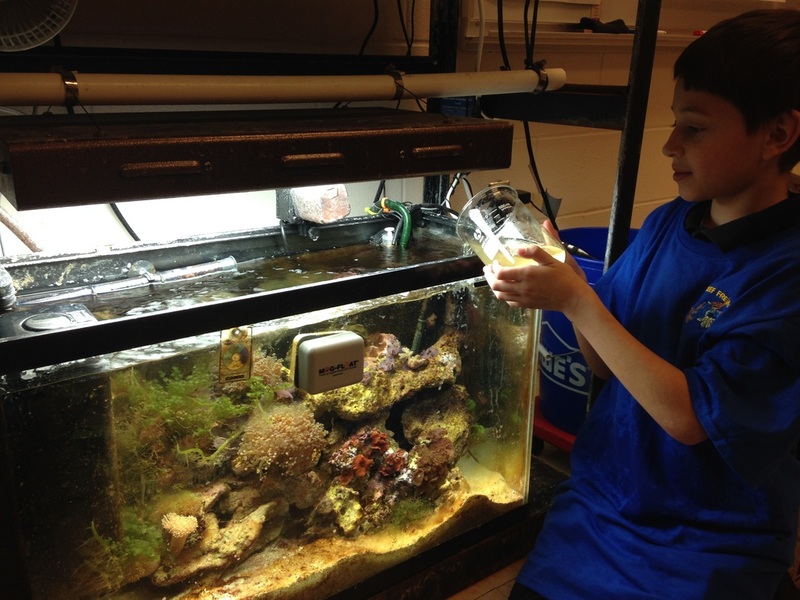 Soft coral tanks can be kept with less expensive equipment and are easier for students to maintain. I prefer to spend my money on invertebrates and coral rather than fish. Invertebrates such as crabs, shrimp, starfish, etc. are cheap, offer students a wider variety of different types of organisms to study, require less food (meaning cleaner water), and get sick less often than fish. Tank build: Aquariums used for teaching are very different from display tanks. They should have open tops, be placed at an appropriate level for students, and be set up to allow for all areas of the tank to be reached by short arms or tools. Teachers on a budget should consider 30-90—gallon tank-only systems on countertops without sumps, rather than having a larger system with stand and sump. 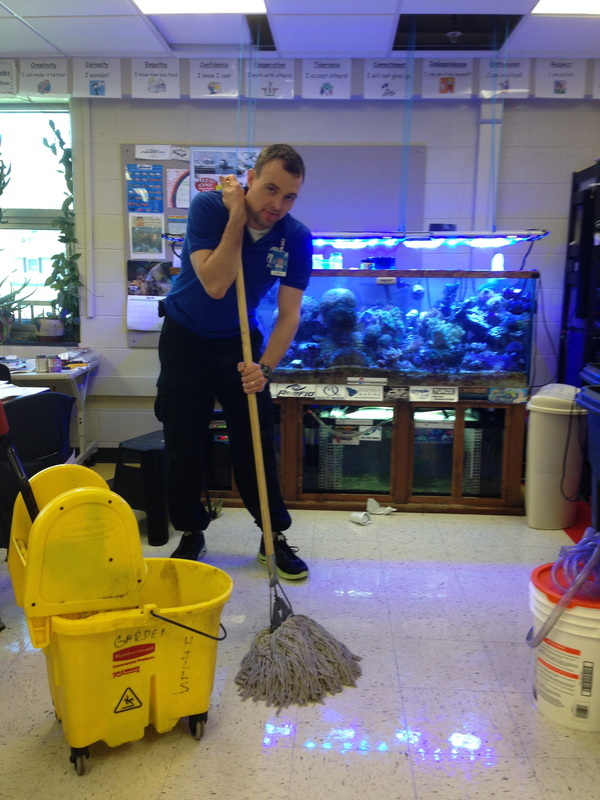 Nano tanks may seem better for a classroom, but are harder to maintain successfully. Canister filters, sponge filters, and hang-on-back skimmers are more economical than traditional sump setups and are easier to set up and take down if the tank needs to be moved. The additional nitrification created by large or multiple filters will go a long way towards “student-proofing” your tank by reducing the chance of an ammonia spike. Andrew pours live rotifers into a small reef aquarium. 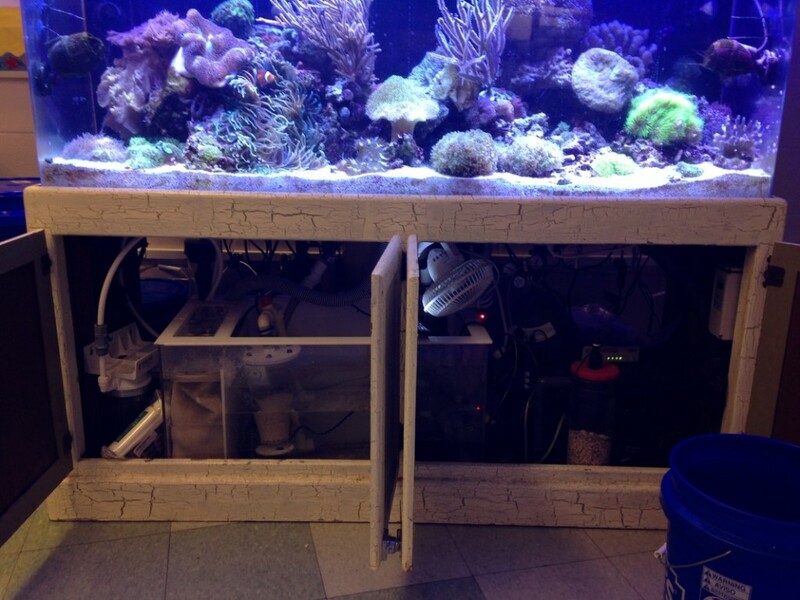 This 30-gallon tank was set up for under $250 and is totally maintained by students. With the exception of the Tunze internal skimmer and osmolator, all of the equipment was purchased in used condition from Craigslist. Macro algae helps to control nutrients, and the tank only receives supplements via 10% weekly water changes. This aquarium is not serviced over the weekends, and I have moved this tank system three times since I built it. Lights can be hung from ceilings or very high stands to allow for them to be moved out of the way when kids are accessing the tank. I am a proponent of deep sand beds, but a bare-bottomed tank allows rocks to be moved without disturbing trapped nutrients, and student helpers can siphon the bottom of the tank frequently to remove decaying biomass. Student can also manually top-off tanks with fresh water and dose supplements by hand, reducing the need for extra equipment. As I’ve gained experience as an aquarist, I have learned to build healthy systems with less equipment. This said, the two pieces of equipment that should be of high quality are the lights and the skimmer. LED lights are initially more expensive but don’t need bulbs to be replaced; they also produce less heat, negating the need for a chiller. Students often over-feed tanks, and a high-quality skimmer will help maintain good water quality. If nuisance algae becomes a problem, I recommend adding macro algae to tanks, setting up a refugium or deep sand bed, or using a bio-pellet reactor. Teachers who don’t visit their classrooms on the weekends might also want to invest in an automatic feeder and auto top-off system. Equipment brands that I prefer are listed on my website. This tank is built with a DIY hanging canopy for lights that can be easily moved to allow full access to the open-topped aquarium. Step stools are kept close by to allow students to access the tank from the top. Viewing screens and long tools like a baster-type pipette allow young students with short arms to reach all areas of the tank. 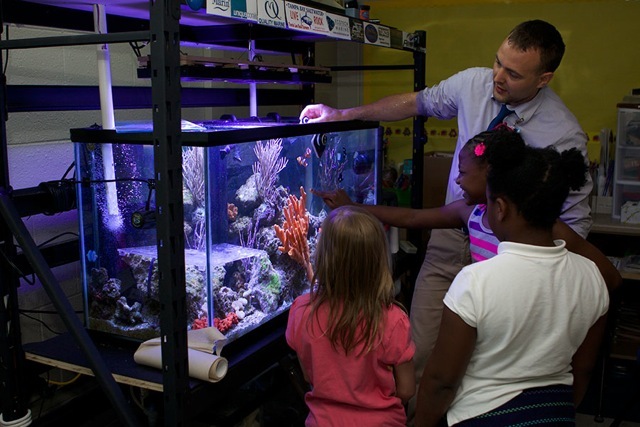 Getting and keeping approval for projects: School administrators will ultimately be held accountable for problems that happen in their schools, and their approval is generally needed before teachers can install large tanks or adapt their curriculum to include aquarium-based learning. Principals will be more inclined to support an aquarium project if teachers proactively communicate how their project is safe and educational. I communicate with my principal on a regular basis, informing her of any changes I’ve made to my setup, and how my instruction is meeting learning goals. In general, I try to prevent people from being able to complain about my project by keeping things clean, safe, and organized. Tanks with sumps should have check valves to prevent overflow during power outages. A mop and wet-vac should be easily accessible (I use mine daily). Care should be taken to ensure that water doesn’t damage countertops, carpet, or flooring. I have industrial rubber garage mats under all tanks on countertops. It’s also important that all teachers develop a relationship with the janitors who clean their rooms. I make a point to never leave more than the average amount of mess for them to deal with. Budgeting: Funding sources for consumables will fluctuate. Be careful not to build a system that uses more salt, food, supplements, or water than you can afford to provide on a long-term basis. Think creatively to find sources of external funding. I will share some secrets for how to successfully fundraise in my next blog post. Safety: Vandalism and misbehavior have been rampant in some of the schools in which I’ve worked, but no student has ever purposefully sabotaged or been injured by an aquarium. However, because of the public setting of a classroom tank, safety should come first. All outlets should have ground fault interrupters and cords should have drip loops. Tanks in high-traffic or unsupervised locations should have locked canopies and equipment stored out of reach of young children. There should be a posted list of rules for viewing tanks, and all staff members and students should be told tank rules and safety information frequently. I give a mini-lesson on aquariums to all of the classes in our school at the beginning of the year. I have also found that students who work on the project are the best guardians of the tanks. Placement in schools: It is best to place tanks in common areas, where they can be accessed by the greatest number of people. The downside is that tanks in common areas are less-easily supervised by adults, further away from drains, and often not in areas conducive to quiet study or messes. The two tanks I have set up in common areas are display-style tanks, with the more student-accessible tanks in classrooms. Placement in room: Tanks should have access to a sink for water changes and grounded electrical outlets for equipment. Large tanks should have access to more than one electrical circuit, and equipment must be carefully separated between power strips to ensure that they do not overload circuits (a broken circuit on a weekend can crash the tank). This is a picture of my third grade classroom last year. 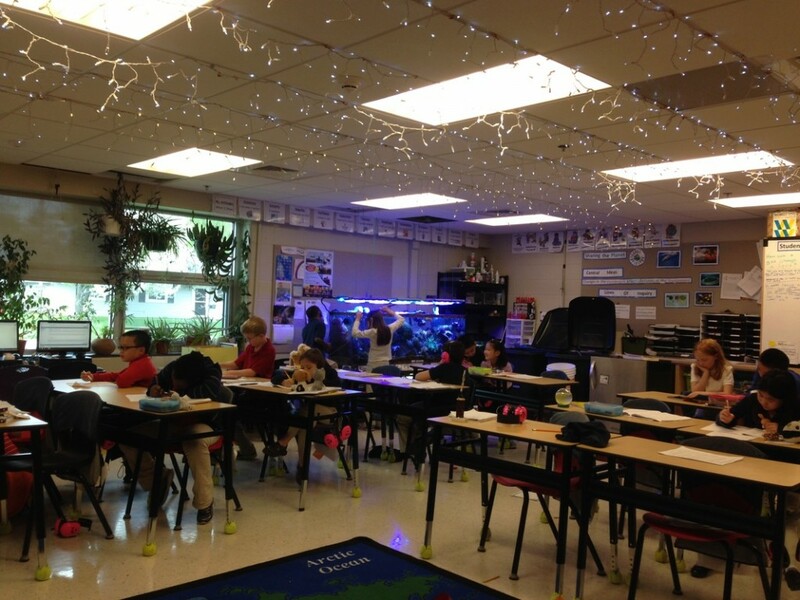 Note how a large reef system and support equipment can be setup unobtrusively in a corner and students can work on tank without disturbing classmates working near by. Complying with code: Teachers should make sure that their tank build complies with their city and school district safety codes. I had a maintenance worker report my project to the fire marshal, and I was forced to privately install six new, dedicated circuits for my project (at a cost of $6,000). I also had to have custom power strips built to facilitate lots of plugged-in equipment so I didn’t “daisy chain” power cords. Equipment should be organized and positioned so that it can be assessed by children (who have less-refined motor control). Note that behind the stand is a 12-plug-in power strip hard-wired to a dedicated circuit. Secondary power strips are connected to the main power strip via GFI and are attached upside down. Equipment plugs are labeled with tape. This tank is in a public area that is not always supervised by adults, so the stand has doors with keyed locks. Drafting additional helpers: As much as possible, I make students responsible for the care and maintenance of the tanks. All staff members at my school have my personal contact information, and they monitor the tanks for overt trouble signs. I have a list of important information posted on the main tanks. Maintenance workers and other teachers have been trained on how to troubleshoot major problems such as an overflowing sump or a power outage. The staff member that participates the most in the project is trained in all of the maintenance needed for the long-term care of the tanks (e.g., water changes, feeding, and monitoring water perimeters). He takes over for me on the rare occasions that I’m unable to come into school. Immediately after starting, I realized that other adults must be involved to ensure the safety and functioning of the project. I will share some advice on how to build participation and capacity in my next blog post. Over time, I’ve learned how to “kid proof” my system, but a mop bucket is still frequently needed. I try to hold kids responsible for their messes, but I frequently have to spend time cleaning up after them. It is very important that I don’t leave this job to other adults. Last year I was called into school on a Sunday by another staff member who noticed 10 gallons of water on the floor after a student left the RO filter running. A float switch and water reservoir permanently fixed this problem. Summer break: Deciding how to take care of fishtanks over summer break may be the decisive factor in deciding whether or not to start an aquarium project in a school. I care for my tanks daily throughout the calendar year, but purchasing additional equipment such as auto top-off systems and electronic feeders can allow tanks to be left for days at a time. Some school staff are present during most of the summer; enlisting their help could be vital. Teachers may also elect to break down tanks every year or set up a temporary large system at home and combine all of the livestock so it can be cared for during the summer. Another option would be to set up a system with livestock that have a limited lifespan. Jellyfish Art makes an easy-to-care-for tank that is perfect for the classroom. The life span of the jellyfish is under one year, making it less of a commitment than longer living fish and coral. Perseverance: Courage and dedication are all that one needs to be successful in aquarium keeping and in life. Planning ahead, learning from mistakes, and not giving up are all important lessons that teachers can model to students through creating and sustaining a classroom project. Keep this in mind and your choice to add an aquarium in your classroom will always be a good one. And, remember that you are not alone: many people will help you along the way. I will respond to comments on this post on an ongoing basis, and I encourage you to contact me through my website. Going further: Building your system is just the first step. In my next blog post I will share some advice on how to fundraise for money and equipment, increase involvement, and ways that educators can use aquariums to teach science and math standards. Stay tuned, and happy building! Furthermore, It’s great that there are time- and cost-effective methods for the construction and maintenance of these tanks and the life within them. You offer a great deal of information on a multitude of aspects regarding the creation, placement, and care of these tanks. I’m sure your advice on project-approval, budgeting tank materials, and choosing effective species for student learning will encourage the introduction of this idea in other schools and facilitate its implementation. I think not only allowing students to visually appreciate the aquatic life, but requiring them to be involved in the upkeep and long-term care for the life is the strongest academic benefit of this project. This will give students a chance to be consistently devoted to a year-long project. Moreover, being exposed to the design of these systems on a daily basis will supplement their traditional math-science-history-english curriculum. I think that having a coral reef system is a unique way to educate students in the classroom. While most curriculum relies on traditional methods, this system teaches students things they would not have learned otherwise. Giving students responsibilities gives them leadership skills and hands on experiences that they generally do not get in core classes. Just as importantly, it is much more exciting and engaging for them and makes them want to participate. This article had a wide range of information for teachers wanting their own aquarium system. Deciding factors such as budgeting and summer breaks were important to me too. Since I have very little experience with these systems, I think that starting out with a jellyfish tank would be best and still educational for students. The benefits definitely outweigh the costs so as a teacher, I will advocate for getting an aquarium system at my school as well. Students will take what they learn from this to become much more well-rounded and knowledgeable. Thank you for all the advice!! Great work with your classroom! Great idea, excellent teaching tool for kids that can easily capture their attention. Maintaining a reef tank can teach & expose them to a wide variety of disciplines, not just marine biology, but also chemistry, physics, electricity, plumbing, construction, engineering, animal husbandry. You mentioned in the section “Getting and keeping approval for projects” that “Tanks with sumps should have check valves to prevent overflow during power outages.” Actually if your reef system requires a single check valve to prevent floods during power outages then your design needs to be reworked. Also take it from dozens of long experienced aquarists that have found the hard way that check valves will simply fail, no matter the brand or quality. I definitely agree that a soft coral/LPS reef tank is far more instructive than a fish-only tank, & that having a variety of invertebrates increases the educational value of the system. Soft corals, & to a certain extent LPS coral, allow for poorer water quality & thus much more forgiving with common issues such as over-feeding. Keep up the good work! Sharing knowledge as you have is the way aquarists have helped each other over the years. We have a Montessori school that we are looking to add a large marine tank to the practical life lesson plan. Problem we have is that we want a main tank that visitors can see from the entrance but have the water plumbed to the classroom refugium where they can test the water and maintain parameters. The thought is to let the children research the design and gradually add to the ecosystem. Do you have any suggestions or advise as to what not to do? This has been inspiring for me. I am now trying to collect funds to create a marine aquarium in my classroom and maybe others! It sounds like something that many students would find interesting. How did you get hooked up with the supporters and sponsors in the marine aquarium industry to help fund your project? Right now I have set up a GoFundMe.com account to get money for startup costs and supplies. Great idea, excellent teaching tool for kids that can easily capture their attention. Maintaining a reef tank can teach & expose them to a wide variety of disciplines, not just marine biology, but also chemistry, physics, electricity, plumbing, construction, engineering, animal husbandry. You mentioned in the section "Getting and keeping approval for projects" that "Tanks with sumps should have check valves to prevent overflow during power outages." Actually if your reef system requires a single check valve to prevent floods during power outages then your design needs to be reworked. Also take it from dozens of long experienced aquarists that have found the hard way that check valves will simply fail, no matter the brand or quality. I definitely agree that a soft coral/LPS reef tank is far more instructive than a fish-only tank, & that having a variety of invertebrates increases the educational value of the system. Soft corals, & to a certain extent LPS coral, allow for poorer water quality & thus much more forgiving with common issues such as over-feeding. Keep up the good work! Sharing knowledge as you have is the way aquarists have helped each other over the years. I think that having a coral reef system is a unique way to educate students in the classroom. While most curriculum relies on traditional methods, this system teaches students things they would not have learned otherwise. Giving students responsibilities gives them leadership skills and hands on experiences that they generally do not get in core classes. Just as importantly, it is much more exciting and engaging for them and makes them want to participate. This article had a wide range of information for teachers wanting their own aquarium system. Deciding factors such as budgeting and summer breaks were important to me too. Since I have very little experience with these systems, I think that starting out with a jellyfish tank would be best and still educational for students. The benefits definitely outweigh the costs so as a teacher, I will advocate for getting an aquarium system at my school as well. Students will take what they learn from this to become much more well-rounded and knowledgeable. Thank you for all the advice!! Great work with your classroom! Brandon, I think that it's spectacular that you are introducing an aquatic zoo and distributing it around your school. This idea seems more interesting and may carry more academic advantages than the standard classroom hamster project :) Furthermore, It's great that there are time- and cost-effective methods for the construction and maintenance of these tanks and the life within them. You offer a great deal of information on a multitude of aspects regarding the creation, placement, and care of these tanks. I'm sure your advice on project-approval, budgeting tank materials, and choosing effective species for student learning will encourage the introduction of this idea in other schools and facilitate its implementation. I think not only allowing students to visually appreciate the aquatic life, but requiring them to be involved in the upkeep and long-term care for the life is the strongest academic benefit of this project. This will give students a chance to be consistently devoted to a year-long project. Moreover, being exposed to the design of these systems on a daily basis will supplement their traditional math-science-history-english curriculum. Great job!! !